Young children live in the here and now. If adults are to make a real difference to their learning they need to seize the moments when children first show curiosity, and support their next steps immediately. This book embraces the concept of planning "in the moment" and emphasises the critical role of the adult in promoting child-led learning, giving early years practitioners the confidence and insight to work and plan in the moment, and enabling the children in their care to live, learn, play and develop in the here and now. Planning in the Moment with Young Children maintains a strong link to practice, providing numerous examples of how practitioners can integrate spontaneous planning and rich adult-child interactions into their everyday practice and early years curricula. 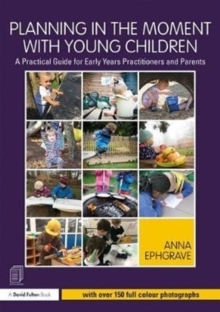 From timetabling to setting clear rules, creating enabling environments, keeping records and making use of a variety of materials, the book demonstrates the multitude of ways in which practitioners can encourage child autonomy and respond to the unique needs of each child. Examples from practice are rooted in theory, fully contextualised, and exemplified by original documentation sourced from the author's own experiences and from a wide variety of settings. Key features include:over 180 full colour photographs to illustrate practice;photocopiable pages including planning sheets, documentation and activity sheets;advice on working with parents, individual children and groups;tailored guidance on working with children at different stages of development from birth to age 6 years;relevance to a range of settings, including childminders, pre-schools, nurseries and schools. When children are allowed to select where, with what, and how to play, they are truly invested in their play, they become deeply involved and make dramatic progress. This book is an outstanding testament to a responsive and child-led way of working in early years environments. Practitioners will be guided, inspired and supported to work spontaneously and reactively - planning as they go and celebrating the results!